Ura Mei Myoichi Bunsei 13 Nen Seisyu. this name on the sword tang at 1831 comfortable clean Autmn. Blade length(nagasa) : 65.0 cm or 26 inches. Width at the hamachi :2.9 cm or 1.14 inches. Width at the Kissaki : 1.92 cm or 0.76inches. Kasane : 0.66cm or 0.26 inches. Kitae :Koitame hada well grained with jinie attach and doft feeling texture. Boshi:Notare and round shape yakisage style. and wrote the name of Myoichi on the tang. This kind of customs happened from middle Edo period. kiku flower syape is engraved and a family crest. fans are engraved with gold color. Blade length(nagasa) : 40.15 cm or 15.8 inches. Width at the hamachi : 3.08 cm or1.21 inches. 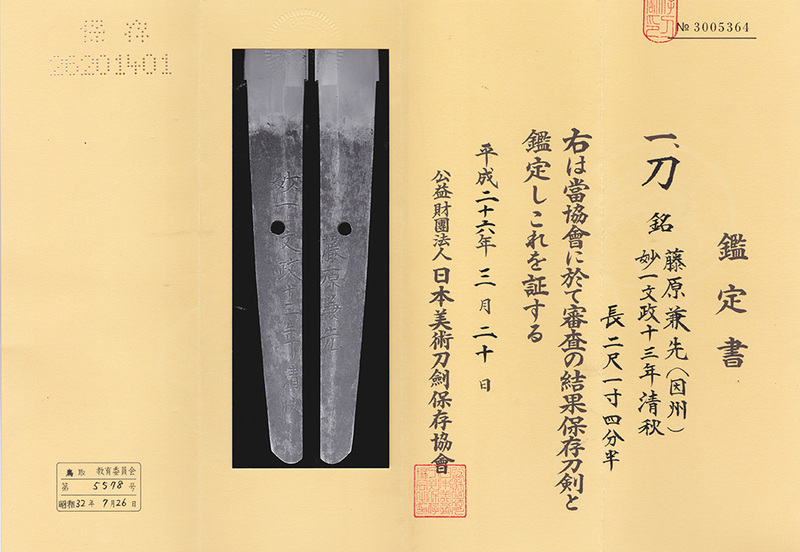 Width at the Kissaki : 2.13 cm or 0.84 inches. Kasane : 0.61cm or 0.24 inches. Era : Edo period Manji era. 1658. Shape : The blade is rather wide and thick and longer kissaki. with jinie attach soft feeling texture. sunagashi and small kinsuji work. Special feature: Bishu Okayama Ju Kunimune was a streams of Bizen saburo Kunimune. He was a son of the Shigeuemon Masashige Manji era. Kozuka:On the syakudo nanako plate, fans are engraved with gold color. Kogatana: The signature is mentioned as Insyu Jyu Kanesaki. I think the owner was high ranking Samurai for usind as Daisyo set. The condition of the Tsuba and fuchikashira are quite nice.